If you have a new Siamese kitty, Egyptian cat names may top your list of potential monikers. These dignified and unique names work well for exotic-looking male or female cats, and there's definitely one on this list that's perfect for your kitty's personality. Siamese Cat Names: Not Another "Fluffy"
Although Siamese cats are friendly and affectionate creatures, there is something about this breed that sets it apart from other felines. Names like "Fluffy" and "Snowball" may serve the average Tabby cat nicely, but somehow they don't really suit a Siamese. Perhaps this is because there is a certain innate sense of dignity that this breed comes by naturally. The first thing that strikes you when you look at one is an impression of regal splendor, even if that splendor hides the heart of a clown who loves to play. For this reason, Siamese deserve names that are a cut above the ordinary. More and more cat owners are turning to unique cat names, and few are as unusual and beautiful as Egyptian names. It's even possible to choose meaningful cat names from this genre that actually say something about your cat's personality. Let's take a look at some lovely Egyptian names for Siamese cats. We'll divide our choices by gender. 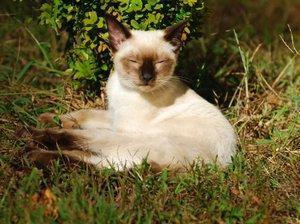 There are plenty of ways you can find the perfect Egyptian name for your Siamese cat. Now that you have a working list of Egyptian Siamese cat names, it's time to decide which one, if any, best suits your cat's appearance and personality. After all, once you settle on a name, your cat will have to live with it for the rest of his or her life. Have you ever tried to change a cat's name once the animal got used to it? It's next to impossible. Take your time observing your cat, both when she's interacting with you as well as when she's on her own. This will give you some good clues about her true personality and help you choose a name that compliments her character. However, you can ignore the meanings of the names if you like, because most of the people you meet won't know what they mean anyway. If you choose this route, select a name you like that rolls easily off your tongue. Practice your choice a few times to see if it "fits. "There's nothing more awkward than selecting a name you love, but are unable to pronounce the same way twice. If you find this is the case with your first selection, move on to another name and try again. If you like Egyptian names, by all means don't stop here. This list is only a portion of the names from which you can choose. With a little digging, you just might unearth a real treasure.